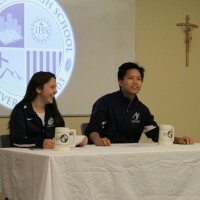 The mission of the Multimedia Club at Arrupe Jesuit is to both capture and advertise the many events that take place throughout the school year. Members of the Multimedia Club have the opportunity to get up close and personal with the major events and personalities that make Arrupe special. This includes (but is not limited to) sporting events, school dances, Open House, and a wealth of other events. This availability, plus our access to high performance equipment, makes the Multimedia Club a place for the teenage mind to run wild (under the close supervision of Mr. Burch).